Dr. Rolando Herts (center) with National Heritage Areas program representatives Heather Scotten (left) and Martha Raymond at the National Trust for Historic Preservation’s PastForward Conference in Washington, D.C.
Dr. Rolando Herts, director of The Delta Center for Culture and Learning and the Mississippi Delta National Heritage Area, was recently invited to represent both organizations in a panel discussion at the National Trust for Historic Preservation’s 2015 PastForward Conference in Washington, D.C. The conference launched a year-long celebration of the National Historic Preservation Act’s 50th anniversary, attracting hundreds of historic preservation scholars, policymakers, experts and activists from around the nation. The session was part of the preservationVOICES Learning Lab presentation track organized by the National Trust in partnership with the National Park Service and the Kellogg Foundation. The session, “Recognizing Our Shared History,” focused on how the NPS works to tell inclusive stories of all Americans, reflecting national values of social and environmental justice. Dr. Rolando Herts. Photo by David Keith. Over 150 conference guests attended the session. Among those in attendance were Martha Raymond and Heather Scotten, NPS colleagues from the National Heritage Areas Program office in Washington, D.C.
“How meaningful to have the National Heritage Areas program represented by Dr. Herts in this national forum, telling the story of the Mississippi Delta National Heritage Area and the important work of The Delta Center and partners,” said Raymond. Herts’s presentation, “Telling the Delta’s Story: Recognizing Our Shared History Through Partnerships,” discussed the MDNHA’s and The Delta Center’s collaborative work with Delta State’s Winning the Race conference and the International Conference on the Blues, as well as Mississippi Valley State University’s BB King Day and the Delta Jewels Oral History Partnership Program. 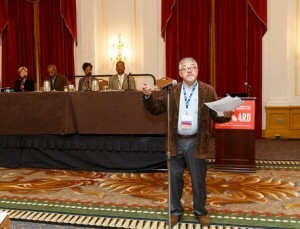 “Recognizing Our Shared History” panelists were led by moderator Dr. Luis Hoyos. Photo by David Keith. Other panelists included NPS representatives Dr. Elaine Jackson-Retondo, National Historic Landmarks program manager; Nigel Fields, acting deputy associate director for Interpretation, Education and Volunteers; and Carol Shively, coordinator for the Civil War to Civil Rights Commemoration. The discussion was moderated by Dr. Luis Hoyos, professor of architecture at Cal Poly Pomona. The National Heritage Areas Program team also displayed MDNHA informational materials and Mississippi tourism brochures at the NPS Find Your Park booth. To learn more about the 2015 PastForward conference, visit http://pastforwardconference.org/.